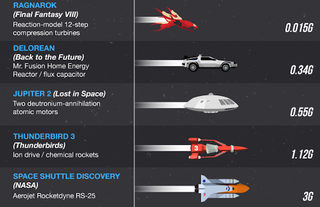 Infographic: What's the fastest ship in sci-fi history? It took a little bit for us to reach Pluto but what if we had the power of our imaginations in our real life spaceships? Fat Wallet came up with this neat infographic showing which ships from popular sci-fi movies, TV shows and video games (plus real life NASA ships) to show which ship moves fastest. It’s pretty cool!